Friday, February 3rd: 2:13pm. Our budget-fare Ryanair flight bounced to a halt upon the breezy, palm-tree enclosed airport runway of Fes, Morocco. I ducked out of my seat at the back of the plane and clambered down the rear steel steps, forcing myself not to run as I go to meet the descending Katie from the front steps. With our hair whipping around in the warm wind, we locked eyes and uttered little squeals of excitement, embracing each other wildly in an excited swaying manner, unfathomably impressed with the warm temperatures of Morocco as compared with the chilly winter Europe that we so recently escaped. A Moroccan taxi driver apathetically holding up a piece of white computer paper with Jozzie Rosell scrawled in black ink met us at the front of the Fes Airport, gesturing to the clean white sedan parked across the lot. He hauled our packs into his trunk, giving it a firm slam, and opened the back doors for us. Katie and I tucked into the back seat, still breathless, still only communicating in small squeals. We took off along the palm-tree laden road, our eyes consumed with the vast amounts of green. Suddenly we began to pass sights previously unseen by the pair of us; goats chowing down on the top leaves of branches far beyond my personal climbing abilities, women and children scrubbing at robes and shawls on washboards outside the house, rows and rows of vibrant oranges hanging juicily from untrimmed trees. Almost instinctively we clasped hands, savoring the moments of exploring this culture together, beyond thankful for the presence and strength of the other. For the durander of our 20 minute drive from the airport to our hostel, we remained hand-in-hand; the beginning of month-long adventure together, symbolic of our mutual intent to support each other and to explore culture together. Friday, March 3rd: 2:02pm. A tall, dark Moroccan man rapped on the cold wood door of the Melting Pot Hostel in Tangier, a thick buzzing from the reception desk opening the door to allow for his passage into the narrow tiled corridor. “Cab”, he said simply, using his index finger to gesture back to the entrance he just stepped through, eyeing the packs that lay at Katie and I’s feet. 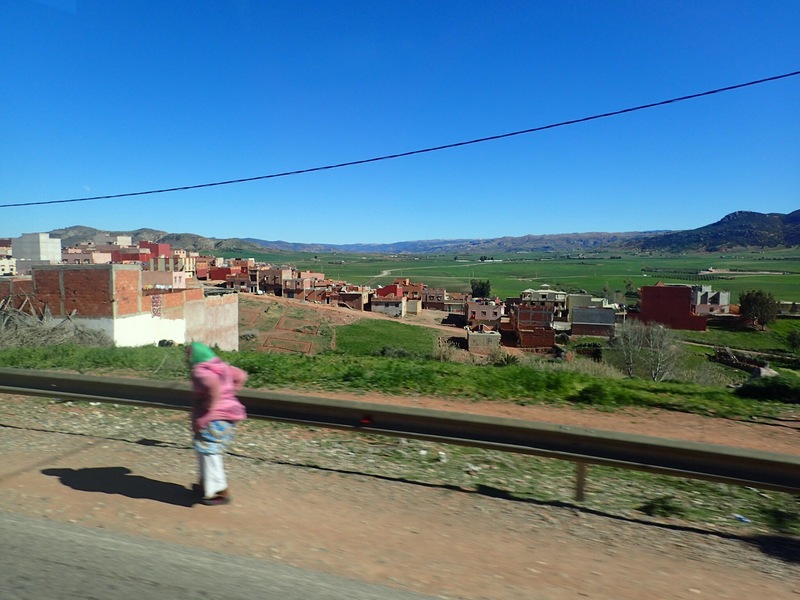 We exchanged solemn glances and hauled our packs back up to our shoulders, pausing to fervently thank the beautiful Moroccan hostel employee that sat smiling behind an old wooden desk before we ducked out the door to follow the driver. He opened the trunk of his clean yellow sedan and grabbed the packs from Katie and I’s shoulders, hauling them into the trunk and giving it a definitive slam. He walked around the car and opened the back door for us, gesturing for us to enter as he took his own position behind the wheel.. I crawled in after Katie, scooting easily on the clean plastic seats. The day was a windy cloudy one, billowy thick rain clouds squeezed the sunlight back into the sky releasing furious shuffles of chilled wind around Tangier. Despite our escape from the wind, we remain breathless; the fact of the matter was that our month in Morocco was coming to a definitive end, and neither of us could wholly believe such a fact would come into existence. Our driver took off along the narrow streets of the cobblestoned Medina, passing underneath tiny arches and barely dodging casual strollers as he squealed around corners. We began to pass sights now wholly familiar to us; the pointy robbed shopkeepers peering behind high stacks of candy bars and boules of round Moroccan bread, scraggled whiskered cats slinked around the feet of hijab-clad Moroccan women, stopping to sniff at small bits of fish that littered the cobblestones from the fish markets. We passed high, beautiful swaying palm trees, dancing to the tune of our bouncing cab; we swung by tourists happily sipping on freshly squeezed orange juice and seeking refuge from the weather underneath old stone archways. In our breathlessness, we instinctively clasped hands, savoring the last moments of our exploration, beyond thankful for the presence and strength of the other. For the durander of our drive from our hostel to the Tangier airport, we remained hand-in-hand; solidifying our immense satisfaction with the proceedings of the last month that we got to spend in adventure, warmth, and fresh orange juice. Little did we know that our adventure would not conclude with a simple flight out of Morocco, but would linger onwards for the next 72 hours as we picked our way back home to Austria.